Only 2 days till Christmas! I hope we are doing more celebrating and less stressing. I hope everyone is having a great time getting ready for Christmas, wrapping gifts, making some final tweak to the menu and most of all having FUN. For the past few weeks, I have been sharing ways to earn cash for the holidays, in a series of blog posts. In this series, I promise to share some ways you can earn some extra cash before the big day. Quite frankly these tips can help you earn cash year round. Best way to earn some extra cash it to not spend it all, but still find ways to get everything you need on less money. Research before buying, just because the deals says prices are slash 50% off doesn't mean it's a good deal. sometimes the prices are raised 50% off then slash so you're actually paying the same. If you take the time to research your purchases it will also help minimize those impulse buys. Cut back on cell phone bills. Nowadays, there are so many options your cell phone bill does not have to be over $100 anymore. 3 years ago I broke up with Verizon after our 10-year run and went to Straighttalk who knew?? I get everything I need for a third of the price. I went from a $120 bill to a $48 bill that's an extra $72 a month raise I give myself automatically. Again research the options to see which plan works best for you. Do you really need all these useless channels? I didn't! Again 3 years ago I broke with directTV, sign up for Netflix and bought a Roku . Best decision I ever made. I went from $150 cable bill to a measly $9 a month, that's an extra $141 a month raise I give myself automatically. Aside from the monetary value of this decision I save so much time by not flipping through all these junk TV I use to waste my time watching, I increase productivity and have more time for important stuff. 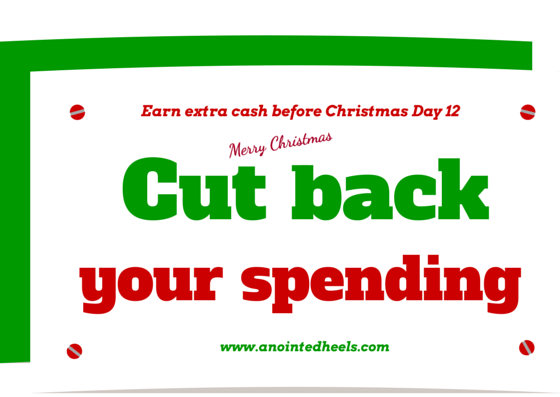 Take the time you're saving from NOT watching junk TV and allocate it to couponing. You can save so much at the grocery store if you have the right coupons. Another unconventional way to save money on food is to grow your own! I understand this is not for everyone but if your thumb is feeling green why not? I bought a Tower garden at the beginning of the year, yes it was a pretty big investment up front but it the long run it is saving me so much on organic food. I grow all my green veggies, salads, sweet peppers, cucumber and tomatoes on my tower. Organic stuff doesn't last, so often my things will go bad before I use them. wasting my hard earn dollars, now I just snip what I need right off my tower garden. What are some fun ways are you using to cut back?